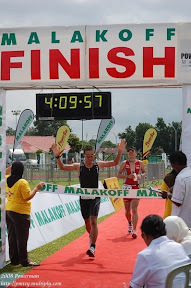 Congratulations to Zulkifle Liman who has managed to finished in a time of 2:57:18 and rank 25 out of 35 GROE runners. As a result of that Brunei overall ranking has move up from 31st to 30th. Well done. The fastest time was by Amos Tirop Matui of Kenya with a time of 2:14:26. I'm still waiting for the full result of Singapore Marathon because I want to see how well the other Brunei runners are doing. Once I get the result, I will post the result overhere.